Fans of anime direction certainly know a lot about the plot of the Japanese TV series One Piece. The fame of this pirate saga about the daring boy Luffy, who decided to challenge the pirates, has long gone beyond Japan. That is why, following the eponymous series, a browser-based computer game was released, which allows each player to take part in the journey of Luffy and his team. 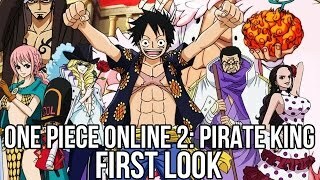 After the first part of the project, the developers, to the delight of fans of the series, released the next version, it was One Piece Online 2. This option may cause a lot of controversy regarding deviations from the original plot, but no one can call this novelty not unique. In this case, the creators of the game did not use the familiar history of pirates, which has been going on for 15 years. A completely different approach was chosen. For the game, the wording of the magic fiction was chosen, which allowed to radically change the whole concept. When creating this online game, the developers took into account the wishes of the fans, therefore the voice acting was performed by the same actors as in the previous part. In this version of the game, of course, there is some fiction, and even neglect of the original plot. But it is on this basis that the developers allowed themselves to create alliances between Luffy and Admiral Borsallino, or the villain Enel. Now you can play One Piece 2 with significant adjustments to what is happening, which provides a more exciting story for the player, of course, there are a lot of such adjustments in the game. The player now has the ability to turn people into zombies during the game, and make Luffy, Zorro and Sanji a team the main enemy of the entire pirate world. Ability to use the hint throughout the game. Even the most dedicated fan of this anime story can get lost in the details of the game. Therefore, for these purposes a special store was provided in the game where you can buy profiles, videos and biographies of the participants. iPlayer One Piece 2 Online is, above all, a game for fans. There are a large number of nuances and features that are familiar only to those who are a devoted fan of the Japanese TV series and the first version of the browser game based on its motives. Fact, that the plot of the series and the original game here is forgotten a little, it doesn’t bother the fans of this game, they start playing One Piece Online 2 and they are captured by a new world of incredible adventures. The plot does not come to the fore in the formulation of the developers, the main thing here is special effects, vivid graphics, dynamic plot development. In order to play Van Pies 2, registration on the site is necessary. After that, the user will be able again and again to return to their favorite moments of the game and go through the most exciting levels, build their strategy, conduct battles and choose the optimal anime character for themselves.